I don’t really remember when we decided it, but if probability has anything to do with it, it was probably after several beers in the Copains d’Abord. Sign up for one of the races. 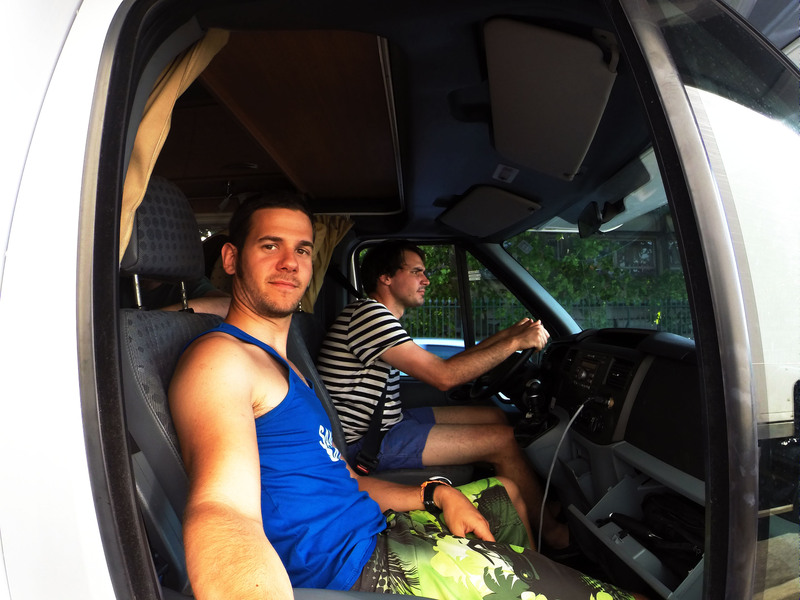 And while we are at it, why not rent a camper van and spend a few days in the region?. 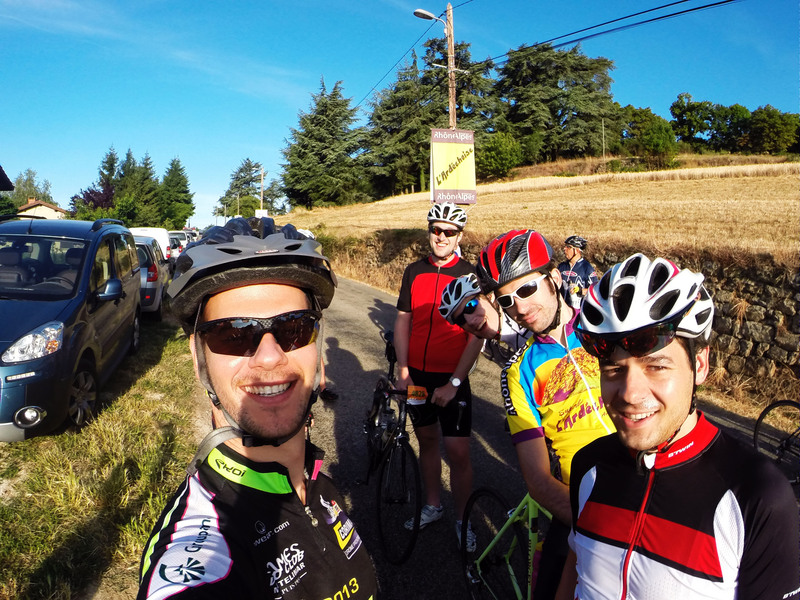 The Ardechoise is a collection of different distance cycling races, which takes place in (you guessed it!) the Ardeche, France over a three day period. With the possibility for serious competition, most participants just go there to finish the race. We of course were in this category. That being said, we decided to go for one of the more ambitious itineraries, La Volcanique, with 178 km and 3200 of uphill. So the procedure was simple: pay inscription, train, race. Or in my case: pay inscription, buy road bike, pretend to train, go to the race. Fast forward about a month and we were almost ready to go. I’d bought my bike, the camper van (or raptor wagon!) had been organised, provisions purchased (basically pasta and alcohol) and logistics sorted. Oh, I wasn’t joking about training; having hurt my knee badly on one of the first training rides, I hadn’t touched my bike for two weeks before race day. Upon being asked by a co-worker, how many kilometres I’d done in preparation, I decided that admitting to climbing St Nizier once and halfway to Chamrousse wasn’t serious. So I lied, badly. My maximum distance being in the 40 km range, the comments “once you hit the 100 km mark you can really feel it” didn’t do much for my confidence either. Get out of work. Get into the van and T and I set off to pick up three of the others who had already biked it past Valence. Once located, their bikes were loaded up and we headed off. We were on holiday! The next day we explored the Ardeche, visiting several of the villages, including Balazuc and Pont d’ Arc. 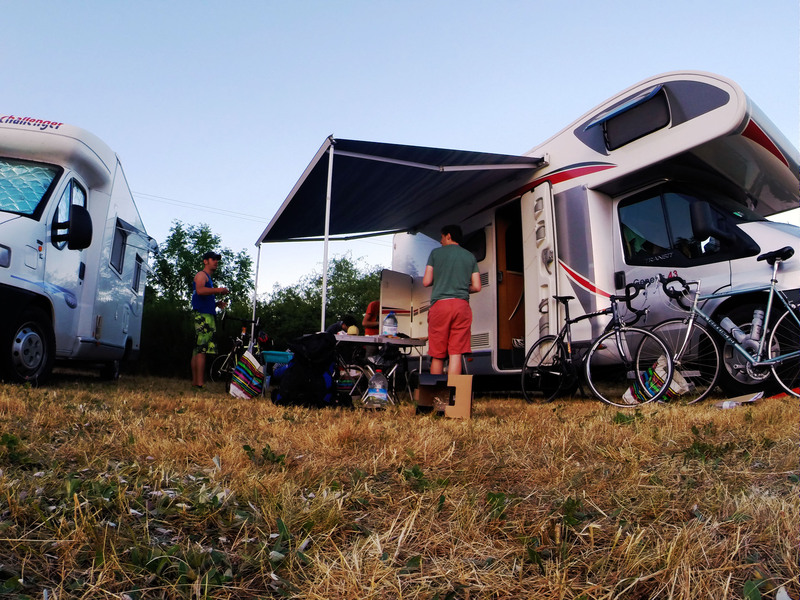 It really feels like holiday country, with camping’s and gîtes everywhere. You can understand why though; it has the “French feel” to it, meaning all the villages are postcard perfect, there are flowers everywhere and there seems to be a total absence of economy. It was great to relax and see some new places, and the weather was good enough to spend some time in the water. At Pont d’Arc, as the name suggests there is an enormous natural arch which crosses the river, making for spectacular scenery. That being said, I think we all preferred the river al Balazuc, which was much less crowded. 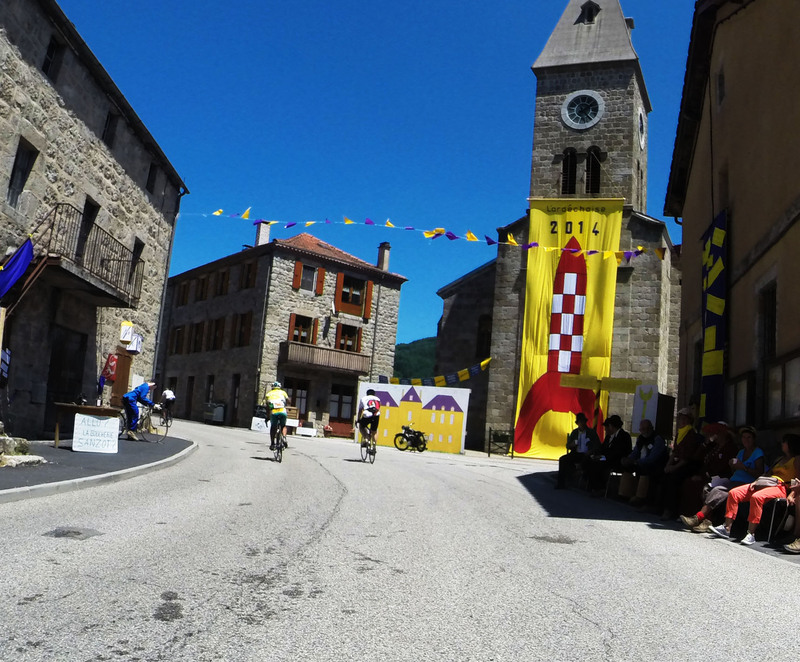 As the Ardechoise cuts through many of the villages, they were decorated with yellow and purple flags, as well as bicycle sculptures. After a day in the sun we headed up past Valence, where we picked up A and headed off to St Felicien, the start and finish of the race. Once the raptor wagon was parked and we had picked up our numbers and paperwork (France remember?) we finished the last details on our bikes (or if you a Mark, a complete overhaul and clean-up of the gears). We were ready! The next day, everyone was getting ready up and early. Bikes were pouring out of cars, vans and camper vans. With around 15.000 participants in all the races, it was busy! Excitedly we wolfed down our breakfast, packed Oreos into our jacked and did the final tests. Speculoos and Nutella sandwiches bring it on! The team is about to set off! With everything ready, and ready to roll, we cycled down to the village and departure. Thousands of cyclist in every possible combination of lycra queuing for the start. We slid into line and slowly worked our way forward. Faster than expected we were there, and with the beep!, beep! of the timing chips were started off! As we slowly picked up speed we started to overtake large groups. To our amazement there were people stopping after 5 min with flat tyres. My principal worry right from the beginning was the state of my knee, and if it would hold out for the entire day. My only objective was to finish the itinerary. 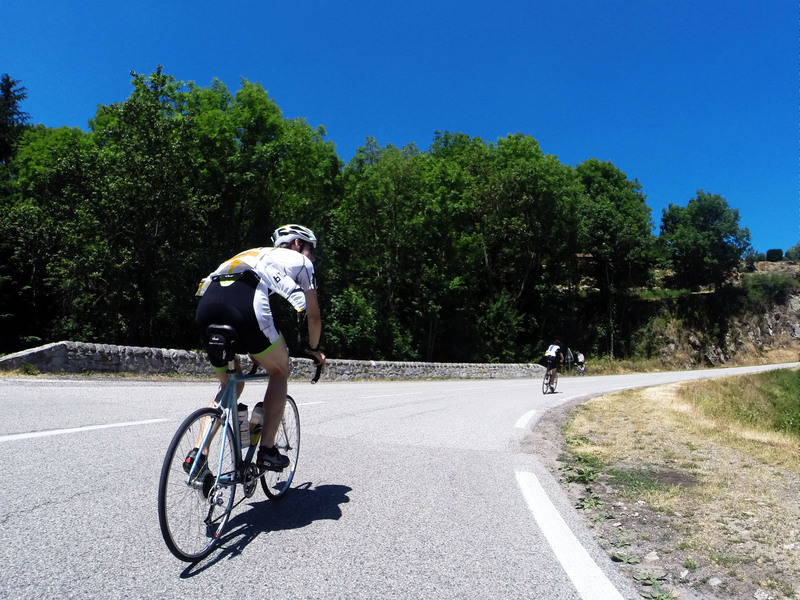 Around 178 km long, it was made up of five cols, the third being by far the highest. The start and finish was in St Felicien, so it draws a large circle shape, with the highest col being the furthest away. So trying to not put too much force into my right leg, we climbed the first col and started the descent. I was still relatively unused to my bike Amapola, but had started to get the feeling for the downhill. During the course of the day I was able to go faster and faster, really gaining confidence in the brakes, managing a whole descent without being overtaken (Hugh was already ahead!). As the hours dragged on we went through various villages and resupplying post to get food and drink. These were being organised by the villagers, who were dressed up in different costumes, including oriental robes, devils and characters out of Tintin. We never did find out why. That being said the ambience was great and everyone was having great fun. Having your name on the back of the jersey meant being cheered on by the villagers with “Allez, Robert, Allez Thomas! With Rockets to the Moon, Tintin cheered our way through. One the flat the team pulled together, and we were able to ride in single file, the speed train! Staying in the speed-shadow means a lot less effort, and by taking turns as the engine, we were able to power our way ahead, overtaking a substantial amount of other cyclists. As we neared the largest col the going got harder and I started to slow. Knowing I still had about half left I couldn’t risk forcing my knee. Constantly worried about dropping out so far from the start, T dragged me all the way to the top and the prize: 20 or so kilometres of pure descent! You just need to keep Hating the Jam! As the day went on and got hotter and hotter, we also started to run out of energy. But thanks to the resupplying posts we could keep going. The final col was short but by far the steepest. Halfway up my knee started to really hurt. But by this point, knowing it was the last climb I didn’t care. Gritting my teeth for the last couple of hundred, I slowly rolled up to the top. On the side several cyclist were just lying in the grass, the heat too much for them. As a I cleared the top all the rest were waiting for me. It was a great feeling of comradeship with which we set off, down the last descent and back towards St Felicien. We had done it! If you think you would like to do the race I really recommend it. There is obviously the official webpage were you can check out all the information and see the different itineraries. As explained I’m by far a good biker and was able to finish, all you need to do is be in relatively good shape. The climbs are much less steep than in the Alps, I think that helped a lot in my case. The organisation is great and it a good way of discovering the countryside as well as riding stress-free on closed and swept roads.